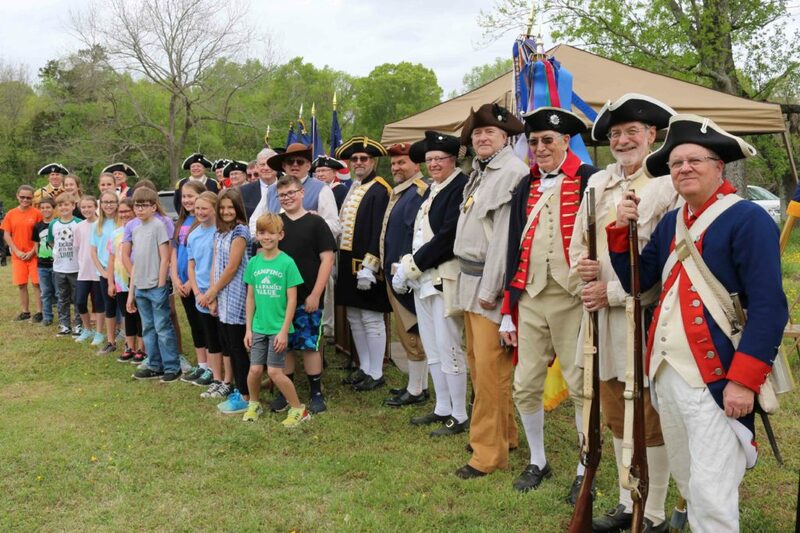 The Halifax Resolves Chapter, North Carolina Sons of the American Revolution, hosted the recent observance of the 243rd Anniversary of the Adoption of the Halifax Resolves at the site of the Colonial Courthouse in Halifax, NC on April 12th. The public and participants were welcomed by Historic Halifax site Manager Mr. Carl Burk and introductory remarks were made by Halifax Resolves Chapter President Mr. David B. Gammon. Halifax Resolves Chapter Chaplain Rev. Duncan H. Jones gave the Invocation followed by the Combined NC SAR Color Guard under the command of Lt. Col. Gary O. Green, USAF (ret.) presenting the Colors. The Pledge of Allegiance was led by Mrs. Valerie Henley’s 5th grade class from Halifax Academy. The SAR Pledge was led by Halifax Resolves Chapter Compatriot Michael Cooper. The reading of the Halifax Resolves was performed by Halifax Resolves Past President Mr. Ken Wilson. Greetings were brought by NC SAR President Mr. James Becker, NSSAR Historian General Mr. John O. Thornhill, VASSAR 1st Vice President Mr. Bill Schwetke, Ohio SAR Secretary Mr. Steven Frash and NC Sons of the Revolution President Emeritus Mr. Daniel L. Hopping. Halifax County Manager Mr. Tony Brown brought greetings on behalf of the county. Mr. Vernon J. Bryant, Chairman of the Halifax County Board of Commissioners, presented a Proclamation from the county in support of the SAR event. Halifax Resolves Chapter President Mr. David B. Gammon introduced the guest speaker, chapter member Mr. Ken Wilson. Mr. Wilson’s presentation informed the gathering of some of the little known stories about Halifax during the Revolutionary War ably assisted at one point by his wife Jan.
A wreath laying ceremony was conducted with the following presenters: Mr. James Becker – NC SAR President / Past President Raleigh Chapter; Mr. John O. Thornhill – NSSAR Historian General, Member Colonel Alexander Lillington Chapter NC SAR; Mr. Bill Schwetke – 1st Vice President / Past President Culpepper Minutemen Chapter VASSAR; Mr. Steven E. Frash – State Secretary / OHSAR Color Guard Commander / Ohio SE District Chairman / Member Marietta Chapter #40; Mr. Daniel L. Hopping – President Emeritus NC Sons of the Revolution. The NC SAR chapters represented were: Mr. Geoff Pittard – VP, Halifax Resolves Chapter; Mr. Don Summers – Member, Alamance Battleground Chapter; Mr. Ron Jones – VP, General George Washington Chapter; LTC Gary O. Green, USAF (ret.) – Past President, Lower Cape Fear Chapter; Col. James H. Wood, AUS (ret.) – Past President, Mecklenburg Chapter and Rear Adm. Jay DeLoach, USN (ret) – President, New Bern Chapter NC SAR. The Virginia SAR chapter were represented by Mr. Gary Hall – President, Dan River Chapter VASSAR and Mr. David E. Cook – 2nd VP, Fairfax Resolves Chapter VASSAR. 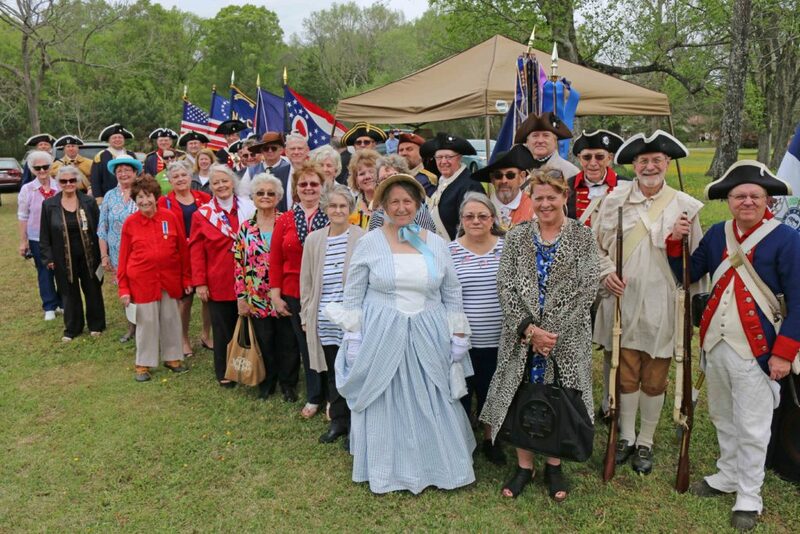 The NC DAR was represented by: Ms. Susan Corliss-Bland – Battle of Rockfish Chapter; Ms. Phyllis Hasty – Regent, Elizabeth Montfort-Ashe Chapter; Ms. Emily Champion – Regent, John Penn Chapter; Ms. Loretta Woodburn – Joseph Montfort Chapter; Ms. Betsy Lee Hodges – Member, Major Reading Blount Chapter; Ms. Helen Sharpe – Member, Micajah Pettaway Chapter; Ms. Lou Ann Dickens Haddock – Member, Susanna Coutanch Evans Chapter and Ms. Betty Bobbitt Willis – Registrar, Warren Chapter. The Virginia DAR was represented by LTC Cat Schwetke, USAF, Ret. – Regent, Fauquier Court House Chapter. The Halifax County government was represented by County Manager Mr. Tony Brown, Mr. Vernon J. Bryant – Chairman, Halifax County Board of Commissioners and Mr. J. Rives Manning – Vice Chairman, Halifax County Board of Commissioners. AmVets Post 320 Commander Mr. Ernest C. Bobbitt presented a wreath representing the veterans. Mr. Michael LaPaglia of The American Friends of Lafayette and the Lafayette Society of North Carolina also rendered honors. Mrs. Valerie Henley’s 5th grade class rendered honors at the wreaths by individually placing American flags in the Halifax Resolves wreaths. Halifax Resolves Chapter member J. Rives Manning led the SAR Recessional after which the Colors were retrieved by the Combined SAR Color Guard. The ceremony was closed with a Benediction from Chapter Chaplain Rev. Duncan H. Jones.